I recently learned of a new academic exploration of the Heaven's Gate UFO religious group. On March 26, 1997, the bodies of 39 men and women were found in an opulent mansion outside San Diego, all victims of a mass suicide. Messages left by the Heaven's Gate group indicate that they believed they were stepping out of their 'physical containers' in order to ascend to a UFO that was arriving in the wake of the Hale-Bopp comet. The Heaven's Gate suicides were part of a series of major incidents involving New Religions in the 1990s, as the new millennium approached. 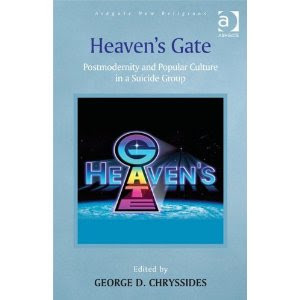 Despite the major attention that Heaven's Gate attracted at the time of the suicides, there have been relatively few scholarly studies. This anthology on Heaven's Gate includes a combination of articles previously published in academic journals, some new writings from experts in the field, and some original Heaven's Gate documents. All the material is expertly brought together under the editorship of George D. Chryssides. Contents: Foreword; Approaching Heaven's Gate, George D. Chryssides; '88 update – the UFO Two and their crew: a brief synopsis, Marshall Herff Applewhite; Seekers and saucers: the role of the cultic milieu in joining a UFO cult, Robert W. Balch and David Taylor; Religious studies and 'heaven's gate': making the strange familiar and the familiar strange, Mark W. Muesse; Heaven's Gate: the dawning of a new religious movement, Patricia L. Goerman; Heaven's Gate: a study of religious obedience, Winston Davis; The Devil at Heaven's Gate: rethinking the study of religion in the age of cyberspace, Hugh B. Urban; 'A sometimes mysterious place': Heaven's Gate and the manufactured crisis of the internet, Douglas E. Cowan; Scaling Heaven's Gate individualism and salvation in a new religious movement, Benjamin Ethan Zeller; 'Come on up and I will show thee': Heaven's Gate as a post-modern group, George D. Chryssides; Postscript; Appendix; Bibliography; Index. About the Editor: George D. Chryssides is Research Fellow in Contemporary Religion at the University of Birmingham. He has written extensively on new religious movements: his books include The Advent of Sun Myung Moon (Macmillan, 1991), Exploring New Religions (Cassell, 1999), Historical Dictionary of New Religious Movements (Scarecrow Press, 2001) and A Reader in New Religious Movements (with Margaret Z. Wilkins, Continuum, 2006). He has contributed to numerous academic journals and edited collections. For further information, or to order a copy visit the Ashgate website.